I never thought I’d find myself in the hills of Texas preparing meals for monkeys and puzzles for chimps. But there I was in San Antonio at Primarily Primates Inc. (PPI) tending to the preferences of a capuchin named Lover Boy, a guenon named Agnes and a chimpanzee named Oliver. With hundreds of monkeys, almost 70 chimpanzees and families of prosimians, the sanctuary is as its name suggests—primarily primates. But PPI is also home to a couple of cougars, a lion, a black leopard, an African wildcat, farm animals and more. There’s even an aviary, and you’ll likely run into peacocks displaying at the guinea hens wandering about. So how did all these animals end up in Texas? In 1978, almost 30 years ago, Wally Swett opened PPI initially housing 19 monkeys and as Swett recalls, “a few assorted other things.” With financial assistance from donors, Swett was able to secure 75 acres of land, and PPI became one of the first facilities in the country to offer sanctuary to animals previously subjected to biomedical research, used in the entertainment industry or housed as exotic pets. Today, the chimpanzees at PPI include famous “actors” like Willie and Harry from the movie Project X and a cast of chimps from Steve Martin’s Working Wildlife training studios. And in the late 1990s, when the Air Force was dispensing with its surplus chimpanzees from the space program, over 30 were sent to PPI, about half of whom are still alive. Former research subjects from the Laboratory for Experimental Medicine and Surgery in Primates in New York and the Buckshire Corporation lab in Pennsylvania have also found their way to San Antonio. Particularly heartbreaking is Oliver’s story. Wild-caught in Africa in the early ’70s as a baby, he was raised in the U.S. by animal trainers Frank and Janet Berger. His teeth had been pulled, and the resulting facial structure coupled with his tendency to walk upright made people speculate he was a human-chimp hybrid—a “humanzee.” This title garnered him much public attention as the supposed evolutionary “missing link.” After years of being on display and sold from one owner to the next, Oliver ended up at the Buckshire Corporation, where he was stored alone in a cell for nine years before being retired to PPI in 1996. At almost every stage of his life, Oliver has been exploited. Now an elder chimpanzee with cataracts and arthritis, he was promised—like all the animals at PPI—a retirement filled with compassion and care. But was PPI providing these animals with the sanctuary they deserved? This question arose in a flutter of e-mails that cluttered my inbox last fall. There was what appeared to be an online dispute between People for the Ethical Treatment of Animals (PETA) and Friends of Animals (FoA) regarding the decision of a Travis County judge to temporarily place PPI under the management of a court-appointed receiver. Having previously volunteered at primate sanctuaries, I flew down to San Antonio on February 17, 2007 with my friend Valerie Chalcraft, a psychologist trained in primate behavior, to volunteer and help out with the needs of the animals. Upon my return I’ve had conversations with sanctuary founder Wally Swett, Lee Hall, FoA’s legal director, Leana Stormont, an attorney with PETA, and Lee Theisen-Watt, the court-appointed receiver. Longtime PPI board member Stephen Tello would not comment for this article. Much of the online discussions about PPI focused on a previous case filed by PETA in April 2006 objecting to the transfer of nine chimpanzees and three monkeys from Ohio State University to PPI [see sidebar]. In August 2006, Swett stepped down from day-to-day operations and was replaced briefly by PPI board member Stephen Tello. FoA offered to merge with PPI to improve the conditions and assist with litigation fees. In September 2006, the OSU lawsuit was dismissed, but attention to conditions at PPI caused the Texas Office of the Attorney General (OAG) to file its own suit against PPI founder Wally Swett and PPI’s board of directors. Charges against the defendants included misappropriation of funds of a charitable trust, public endangerment, negligent conditions for the animals, inadequate veterinary care and substandard facilities. Allegations against PPI founder Wally Swett included animal hoarding and alcoholism, both of which are suspected to have led to the neglect of animals in his care and the squandering of monetary resources. On October 13, 2006 the court seized control of PPI and appointed Lee Theisen-Watt, a wildlife rehabilitator, as the temporary receiver to maintain the sanctuary while the court proceeded in litigation against previous management. This wasn’t the first time the OAG took action against PPI. In the early 1990s, a similar case was brought against Swett and board member Stephen Tello. The case was settled, but complaints from former employees and visitors continued. In November 2006, Stephen Tello, FoA and FoA president Priscilla Feral were found in contempt of court and ordered to desist soliciting funds on behalf of PPI and interfering with PPI’s fundraising efforts during the court ordered receivership. They were, however, allowed to continue to solicit funds expressly for their legal fees. Unfortunately, the politics of the situation does not bode well for the animals, as concerned activists and sanctuary donors are left confused and uncertain about what to do and who to believe. Lee Theisen-Watt, the court-appointed receiver agrees, “They were way understaffed. The only way they got away with it was they never went in to clean [enclosures]. They only hosed out the filth and they didn’t give the animals any bedding. [The primates] were only fed once a day and it was just primate chow biscuits.” She further notes, “You can tell by the enclosure designs, they had no intention of ever really having access to get in and clean. That’s why they never had bedding and why their enrichment was exceedingly limited. They never had a strong employee base, and they never had volunteers. There are a few exceptions, but very few.” Under the receivership, the staff was increased to 22 employees, and they were planning on hiring more. The chimpanzee enclosures had an outdoor space and indoor night cages. The night shelters we saw were dark, dismal and cramped. Doors had rusted shut. It was unclear to the receivership how often these areas were cleaned since the existing infrastructure did not allow access to enter. I asked Swett about the frequency of cleaning and he responded, “The inside is done on a weekly basis, and the outside on a daily basis.” Swett didn’t find the rust a problem. “We use so much water that they will rust up and get sticky. I’m sure you have a padlock that you don’t use all the time. They get rusty inside. They need to be sprayed with some oil on a weekly basis and that keeps them going.” In actuality, the fix was more complicated than that. Almost all doors were completely inoperable and the work of welders was required to create access. Swett was very proud of their cleaning technique, “We’ve got a high-pressure water system, which brings cleaning of each enclosure down to about five minutes.” The facility, however, lacked a septic system, and the untreated animal waste run-off from the hosing posed environmental concerns and resulted in one of four violations from the Texas Commission of Environmental Quality. Swett laughed when I brought up the environmental issues of the run-off, citing a nearby horse stable and cattle ranches that presumably were larger culprits. I pressed the breeding issue further with Swett, who remarked, “This is something new about sanctuaries never having a birth. I don’t know who made up the rule, but it’s not a law or anything like that. That’s not something they could make a law out of. Certain people think sanctuaries should never breed, other people think that they might if there is the possibility of a bona fide release program for the future of the species.” But the animals in question, the chimpanzees and domestic animals, were not part of a wildlife reintroduction program. Upon my arrival at PPI, I was bombarded with stories from the staff and volunteers about what the situation was like immediately after the takeover. Triage was how they described it. They inherited a rodent and roach infestation, a sewage problem and the unenviable task of working with the existing infrastructure. One case in point was how the night box enclosures for the monkeys were situated on the ground, rarely cleaned, and provided virtually no protection from the elements. Monkeys prefer to perch when they sleep and feel safer off the ground. Many opted to stay outside instead of retreating to their damp and dirty night boxes. Either way they were still vulnerable to freeze. My friend Valerie Chalcraft and I spent the majority of our volunteer week caring for the animals in the makeshift on-site clinic. Our wards included capuchins, guenons and a bush baby—all healing from amputations of their fingers and tails due to frostbite. Chance and Christina French, two of the care staff under the receivership, formerly worked for Carole Noon’s Save the Chimps sanctuary. They had extensive experience rehabilitating chimpanzees from the notorious biomedical facility, the Coulston Foundation. 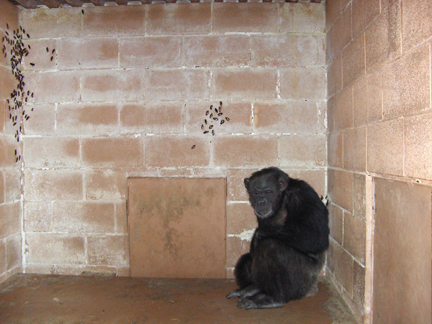 They said the conditions they initially saw in the chimpanzee night enclosures at PPI—dark, dirty, barren and cramped—were worse than what they found at the Coulston Foundation. “The only thing that kept us going was the thought that we were going to be able to make a difference in all of these amazing, forgiving lives,” Chance French reflected. Improvements were ongoing. Humans could now access inside enclosures, so regular cleaning became routine. With a grant from the New England Anti-Vivisection Society, tunnels between enclosures were created so chimps could be transferred during cleaning. Tunnels were also installed between many of the monkey enclosures to also facilitate transfer and cleaning. Jungle Friends Sanctuary in Florida sent a team of volunteers to help make some of the monkey enclosures more monkey-friendly—constructing perches, rope swings and climbing structures. The National Anti-Vivisection Society helped fund vasectomies for all the male chimps. Vasectomies were also performed on cavies and a few other breeding populations. The primates were given fresh produce, nuts and treats daily, which resulted in a tremendous change in temperament, as the animals began to trust this would be routine. Initially though, “you gave them a piece of fruit and they were grabbing and stuffing it in their faces, like they had never seen it and were afraid they would never see it again,” Stormont recalled. Enrichment for their psychological well-being was also introduced. “In natural environments, much of the day involves the search for food. If food is too easy to obtain in captivity, the individual is left with lots of free time, which leads to stress and the development of abnormal behaviors,” Valerie remarked. “Fresh produce placed in food puzzles is a healthy way to maintain primates’ interest, enhance their days and reduce stress.” She and I spent our spare time crafting such enrichment projects for the chimps, monkeys and gibbons. While changes under the receivership were underway, much work was still needed to revitalize PPI. When the receivership started on October 13, the number of animals present according to Theisen-Watt was 740, not including the fish. Roughly 250 domestic animals were relocated within the first few weeks. The Houston SPCA took the majority, and others were relocated to wildlife rehabilitation centers. The seven OSU chimps were transferred to Chimp Haven in November. Theisen-Watt reported by the end of April 2007, the number of animals at PPI was reduced to 445. FoA has, however, opposed the decision to move animals and expressed concerns that some have been transported to zoos and other institutions of use. On April 27, 2007, Judge Guy Herman accepted a settlement agreement between the Office of the Attorney General and PPI, terminating the receivership on May 1, 2007. All charges against PPI and FoA were dropped and the old board of directors was dismissed. The restructured board includes FoA president Priscilla Feral, attorney Eric Turton, veterinarian Michele Martino, Doug Kirk and two members of the previous board, Lou Griffin O’Neill and Robert MacNaughton. Founder Wally Swett is prohibited from serving on the board, as executive director or as an employee, and has been given 120 days to vacate from his residence on sanctuary grounds. Previous board member Stephen Tello will direct daily operations. According to Tom Kelley at the OAG, “The troubling conditions at Primarily Primates have been remedied as a result of the Office of the Attorney General’s intervention. Through the temporary receivership, the condition of the facility has been greatly improved and overcrowding has been alleviated.” He further added, “Under the OAG-negotiated settlement, the individual responsible for the unhealthy conditions will be permanently prohibited from serving as Executive Director of the organization. Equally important, a new board of directors will be appointed and the OAG will retain the authority to monitor ongoing activities at the facility.” The agreement stipulates conditions for the return of the seven OSU chimpanzees from Chimp Haven back to PPI, but does not specifically address the fate of the other animals transferred under the receivership. What lies ahead is no easy task. Stephen Tello and the restructured board must reassure the public that operations will not return to what was “business as usual,” under Swett and the previous board. There is much to do, but if the focus remains on the animals, the work becomes clear. With enough staff, time and resources, PPI has the potential to transform into the true sanctuary the animals deserve. As animal advocates, it is important we share our concerns as well as lend our support for the future of PPI. The animals need not be pawns of movement politics. Not only do we have to make sure their fundamental needs are met and they are given as much dignity as captivity allows, we must also work to stop the exploitive industries from which they were rescued. 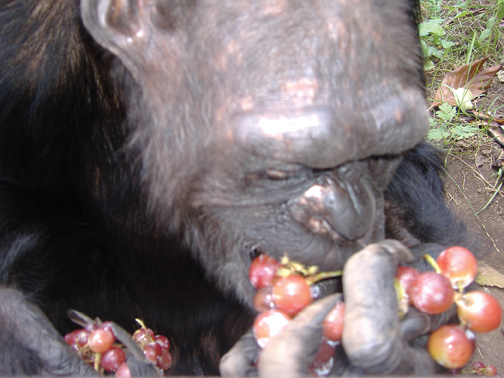 My experiences with captive rescued chimpanzees have been both heartbreaking and hopeful. They are a painful reminder of some of the awful things we humans do to other species. But I also know their amazing capacity to heal and forgive. It’s critical that we find a way to give all the animals at PPI the opportunity to do so. Sangamithra Iyer is the assistant editor of Satya and a licensed professional civil engineer. She considers herself a plant-eating primate who is humbled to have been in the presence of great apes. She hopes to continue Satya’s commitment to creating social change.